President Rodrigo Duterte on Monday night met with militant leaders after he delivered his first State of the Nation Address (Sona). 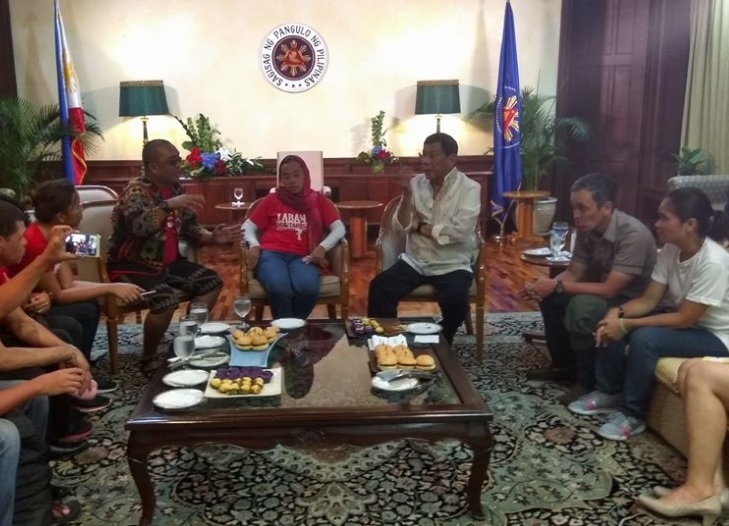 Duterte met with Bagong Alyansang Makabayan secretary general Renato Reyes and some militant leaders at the House of Representatives. 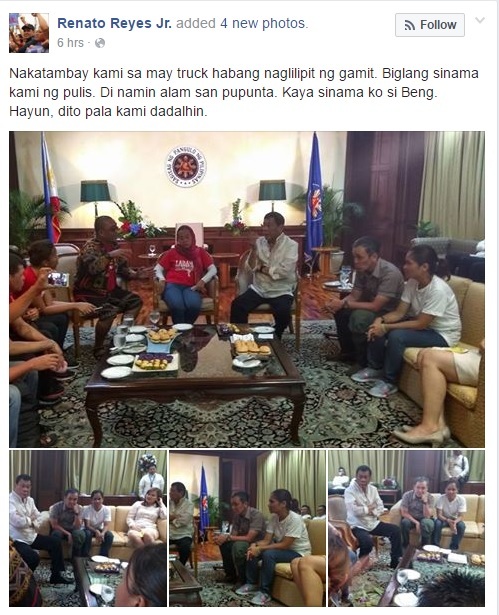 In his Facebook post, Reyes shared photos of their meeting with Duterte as he narrated how they were able to meet with the President. “We were seated at the island along Batasan Road, resting while waiting for the pack up of the stage when we were approached by the PNP who asked us to go with them. The PNP did not say where and why,” Reyes said. But he said they were surprised when they were brought to the President. “Turns out we were brought to a lounge where the President was waiting. He wanted to meet the activists gathered outside,” he said. During the meeting, Duterte and the militant leaders talked about peace and social services in conflict-stricken areas. “In the meeting with the President, we talked about peace and how the president wanted to devote more resources to social services once the armed conflict was resolved. He talked about how the Lumad can return home without fear for their safety,” Reyes said. The meeting, he said, started at 7 p.m. and ended at 8:30 p.m.
“It was a gesture we truly appreciated. A lot of firsts indeed in the president’s first Sona,” he said. This year, protesters were allowed to hold their rally near the Batasang Pambansa compared to last year where they were allowed only along Commonwealth Avenue. Police authorities said the rally this year turned out to be peaceful compared to the violent and bloody dispersal in previous Sona. This was not the first time Duterte met with militant leaders. On June 30, the President huddled with activists after his inauguration in Malacañang. Some Cabinet positions of Duterte were also occupied by progressive leaders.